Written and directed by Tony Gilroy, Michael Clayton is the story of a law firm fixer who uncovers some dark truths about a client involved in a class action lawsuit that revolves around the effects of toxic chemicals. The film is a legal thriller that explores a man trying to seek out the truth as he is also dealing with forces that want to stop as the titular character played by George Clooney. Also starring Tom Wilkinson, Tilda Swinton, and Sydney Pollack. Michael Clayton is a riveting yet compelling film from Tony Gilroy. The film follows a man whose job is to clean up messes for a law firm and handle things so that he can the job done and let the firm succeed and make whatever deal is need to be made. It’s a job he’s good at but it hasn’t done him a lot of favors personally or financially as the film has him dealing with a friend, who is a top attorney at the firm, who had made a chilling discovery in a lawsuit over toxic chemicals made by a company that he’s supposed to defend. Tony Gilroy’s screenplay opens with a sequence of what Michael Clayton does in his line of work but also the danger of his work. The narrative then shifts to what he was doing four days earlier as he is struggling to pay off debts of a restaurant he co-owns with his troubled younger brother as well as cleaning things up for his firm. Yet, Clayton also has to deal with the sudden mental breakdown of friend and top attorney Arthur Edens (Tom Wilkinson) during a deposition as Clayton would have a hard time trying to watch Edens. Gilroy’s script also play into not just what Edens would discover but also play into the morality that Clayton would gain in what Edens discovers. Still, he has to hide Edens from this company who has sent their general counsel Karen Crowder (Tilda Swinton) to handle things and to try and shut Edens down. Crowder is an interesting antagonist as someone who is also a fixer of sorts but is more ruthless in how she deals things. Yet, she is also someone that is just as troubled as she is first seen in the film exhausted while is also trying to be this embodiment of professionalism which is starting to take a toll on her. Once Clayton learn what Edens wants to unveil, it forces him to do what is right no matter how much it would put him into trouble. Especially with the people he’s worked for so many years. Gilroy’s direction is very simple as he doesn’t go for anything stylish in favor of something that is straightforward. Shot on various locations in New York City and areas in upstate New York and Wisconsin, Gilroy would use some wide shots to establish some of the locations but he would aim for more intimate shots in the close-ups and medium shots to play into the drama. Especially in scenes where Clayton is talking to Edens about the latter’s mental condition as Gilroy creates moments that says a lot into what is happening where Edens isn’t just falling apart but is also seeking something that shows some good in the world. Gilroy also creates a world that is quite slick and unforgiving where there are often images of buildings as it would eventually become stifling for Clayton. Gilroy would also create moments that play into the suspense such as the scene of the car bomb and to show it again from a different perspective as it play into the forces that want Clayton gone. It shows how far some are willing to protect something they don’t want the public to hear all for something trivial as money and power. Overall, Gilroy creates a gripping and intoxicating film about a law firm’s clean-up man dealing with a mess that he knows that he can’t cover up. Cinematographer Robert Elswit does excellent work with the cinematography from the way some of the scenes at night are lit to some of the scenes in the day that are quite natural including the car bomb scene. Editor John Gilroy does nice work with the editing as it very straightforward with a few jump-cuts to play into Crowder‘s own daily routine and rehearsing for her speeches. Production designer Kevin Thompson, with art director Clay Brown and a team of set decorators in Paul Cheponis, George DeTitta Jr., Christine Mayer, and Charles Potter, does fantastic work with the design of the offices as well as the apartment homes that the main characters live in as well as the home of Clayton‘s family in the suburbs. Costume designer Sarah Edwards does nice work with the costumes as it‘s mostly low-key from the suits that the men wear as well as the clothes that Crowder wears and the clothes of the men she hires to do her dirty work. Sound editor Paul P. Soucek does terrific work with the sound as it play into many of the locations as well as a scene of Edens playing a tape over and over again to create something to blow the whistle on what he found. The film’s music by James Newton Howard is amazing for its low-key orchestral score that play into the drama as it also include some ambient-based electronic music that help add to the drama and suspense. The casting by Ellen Chenoweth is great as it feature some notable small roles from Katherine Waterston as an aide of Clayton in Wisconsin, Austin Williams as Clayton’s son Henry, Sean Cullen as Clayton’s detective brother Gene, Denis O’Hare as a client Clayton deals with early in the film, David Lansbury as Clayton’s younger and recovering drug-addict brother Timmy, Terry Serpico and Robert Prescott as a couple of men Crowder hire to deal with Edens, and Ken Howard in a terrific performance as a company chief that Crowder is trying to protect. Michael O’Keefe is superb as Barry Grissom as a law firm executive that is trying to oversee the deal as he is someone that Clayton doesn’t like. Merritt Wever is fantastic as Anna as a young farm girl suing the company that she believed ruined her family farm and killed her parents. Sydney Pollack is excellent as Clayton’s boss/friend in law firm partner Marty Bach as a man that is trying to keep things under wraps as well as be aware of the fact that the business of law is changing. Tilda Swinton is brilliant as Karen Crowder as a corporate general counsel that is trying to make sure that the settlement goes well as she is also dealing with the strain of her work. Tom Wilkinson is amazing as Arthur Edens as a senior litigator with bipolar disorder that would unravel mentally as he copes with the task he’s being forced to do as well as make a discovery that would impact everything. Finally, there’s George Clooney in a phenomenal performance as the titular character as a fixer who cleans up messes for his law firm as he deals with the mental breakdown of a friend as well as making a major discovery where Clooney is quite reserved in his performance but also someone who is conflicted in wanting to do what is right. Michael Clayton is a remarkable film from Tony Gilroy that features an incredible performance from George Clooney in the titular role. Along with a great supporting cast that include top-notch performances from Tom Wilkinson, Tilda Swinton, and Sydney Pollock as well as a well-crafted script. It’s a film that play into the legal world and what some will do in the name of greed and power. 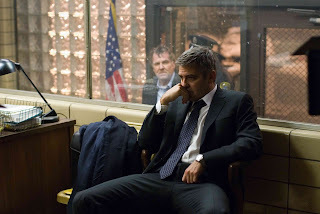 In the end, Michael Clayton is a marvelous film from Tony Gilroy. I've still never seen this. It didn't look very interesting to me when it came out, but then everyone started raving about it. Some day. lol Great review!